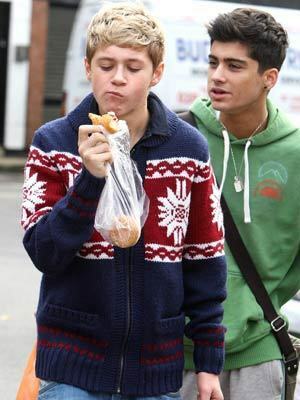 Niayn/Ziall Bromance (U've Gota Love Em') Whats Niall Eating Now Lol 100% Real :) x. . Wallpaper and background images in the Niall Horan club tagged: niall horan. oh god!! he is always eating!!! how is he sooo skinny!! zayn looks as if he is saying "can i have some?" and niall is like "NO!!" lol!!! ya lol!! i tink da camera just catches him at the wrong time!! !